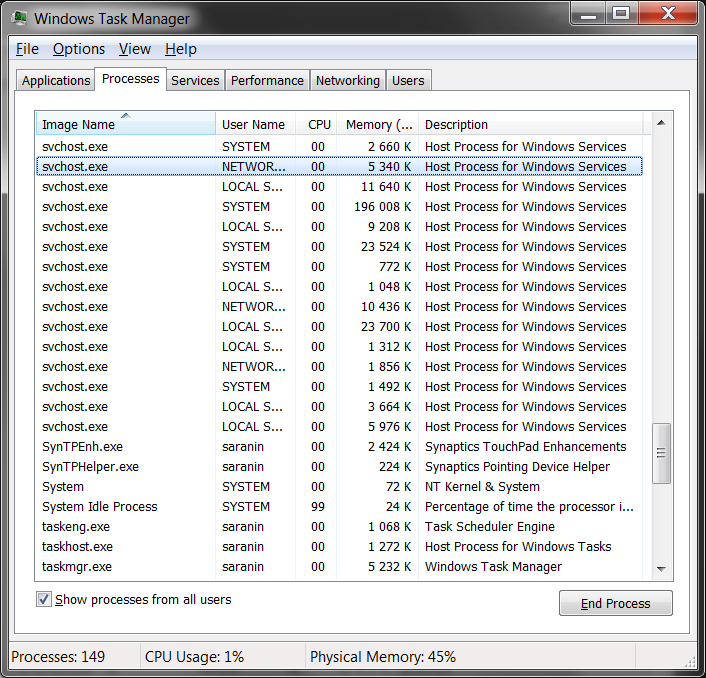 You are no doubt reading this article because you are wondering why on earth there are nearly a dozen processes running with the name svchost.exe. You can't kill them, and you don't remember starting them… so what are they? 1 So What Is It? 2 Why Are There So Many svchost.exes Running? 3 So What Can I Do About It? According to Microsoft: "svchost.exe is a generic host process name for services that run from dynamic-link libraries". Could we have that in english please? Some time ago, Microsoft started moving all of the functionality from internal Windows services into .dll files instead of .exe files. From a programming perspective this makes more sense for reusability… but the problem is that you can't launch a .dll file directly from Windows, it has to be loaded up from a running executable (.exe). Thus the svchost.exe process was born. Why Are There So Many svchost.exes Running? If you've ever taken a look at the Services section in control panel you might notice that there are a Lot of services required by Windows. If every single service ran under a single svchost.exe instance, a failure in one might bring down all of Windows… so they are separated out. Those services are organized into logical groups, and then a single svchost.exe instance is created for each group. 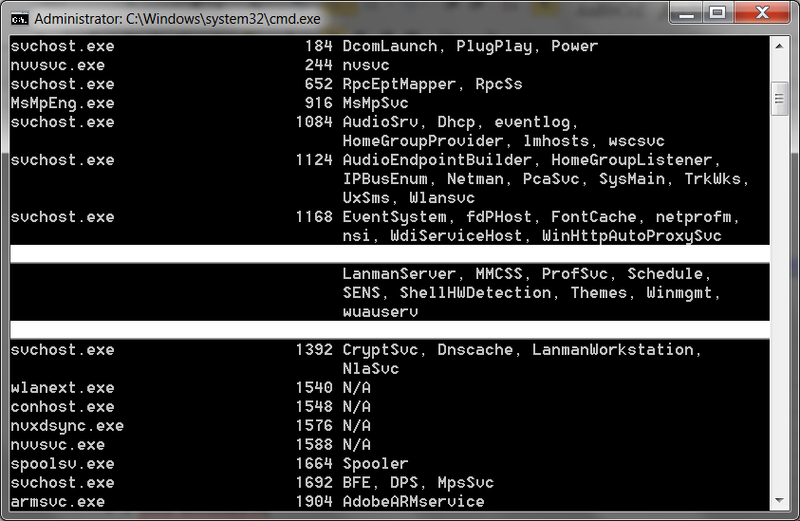 For instance, one svchost.exe instance runs the 3 services related to the firewall. 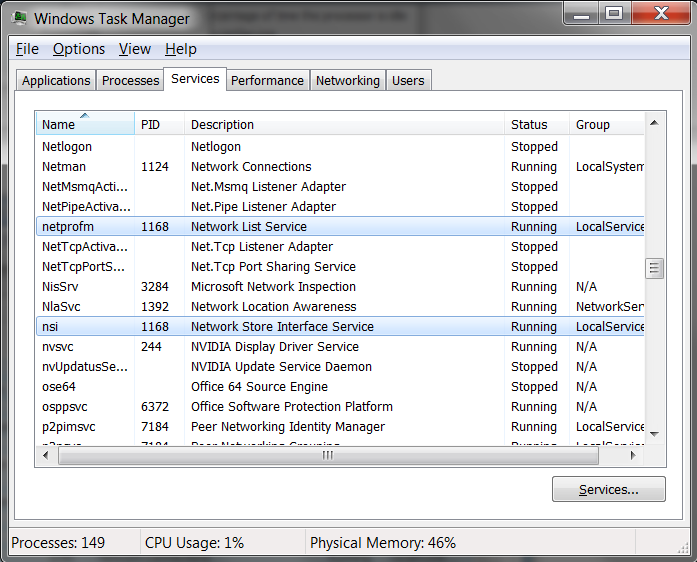 Another svchost.exe instance might run all the services related to the user interface, and so on. You can trim down unneeded services by disabling or stopping the services that don't absolutely need to be running. 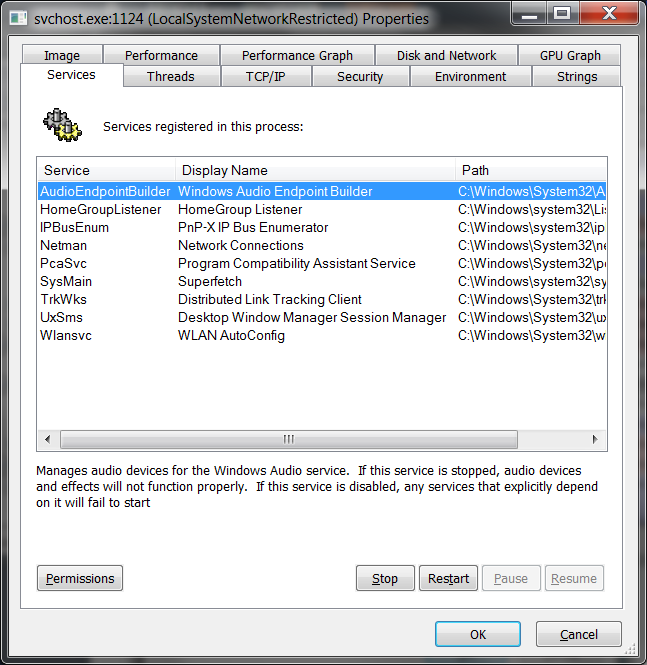 Additionally, if you are noticing very heavy CPU usage on a single svchost.exe instance you can restart the services running under that instance. The biggest problem is identifying what services are being run on a particular svchost.exe instance… we'll cover that below. If you want to see what services are being hosted by a particular svchost.exe instance, you can use the tasklist command from the command prompt in order to see the list of services. The problem with using the command line method is that you don't necessarily know what these cryptic names refer to. 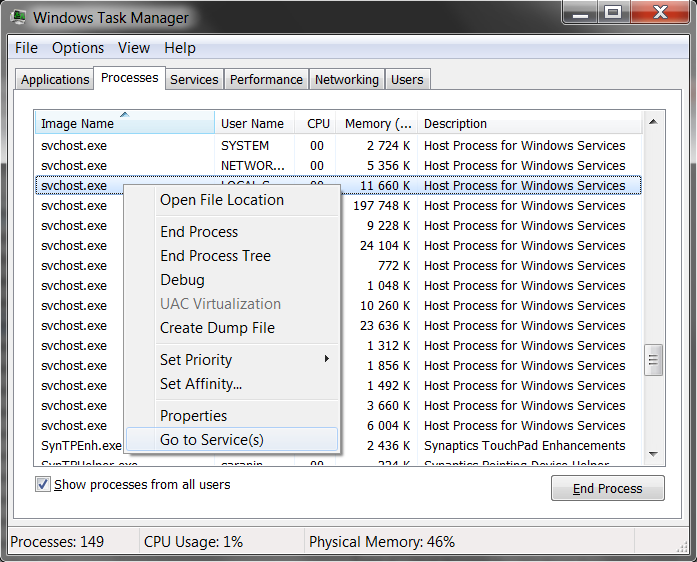 You can right-click on a particular svchost.exe process, and then choose the "Go to Service" option. The great thing about doing it this way is that you can see the real name under the Description column, so you can choose to disable the service if you don't want it running. 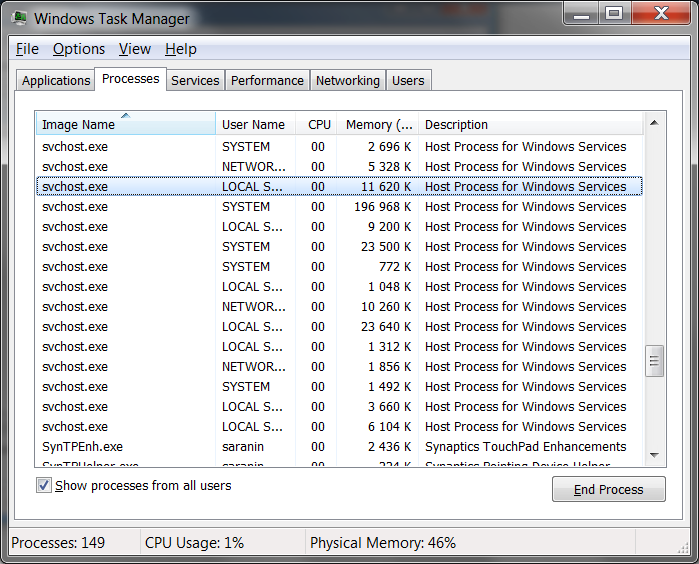 You can use the excellent Process Explorer utility from Microsoft/Sysinternals to see what services are running as a part of a svchost.exe process. Or you can double-click on a svchost.exe instance and select the Services tab, where you can choose to stop one of the services if you choose. Open up Services from the administrative tools section of Control Panel, or type services.msc into the start menu search or run box. 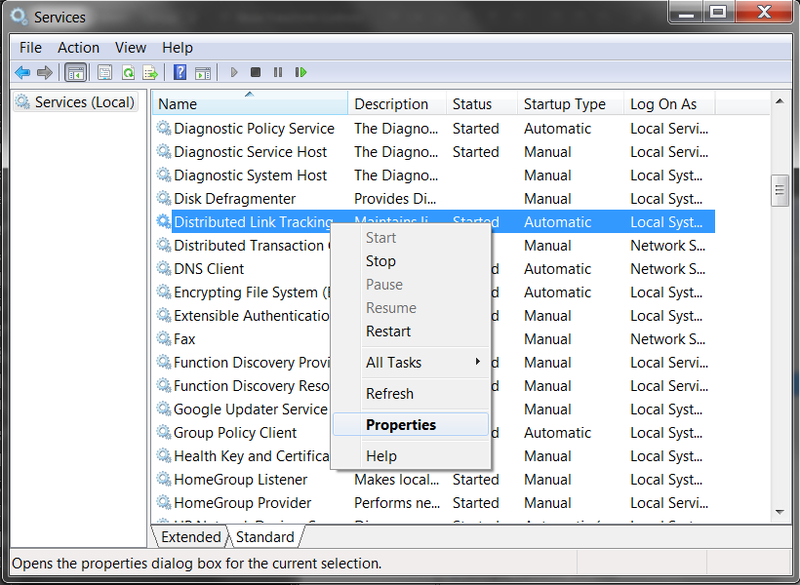 Find the service in the list that you'd like to disable, and either double-click on it or right-click and choose Properties. Change the Startup Type to Disabled, and then click the Stop button to immediately stop it. You could also use the command prompt to disable the service if you choose. 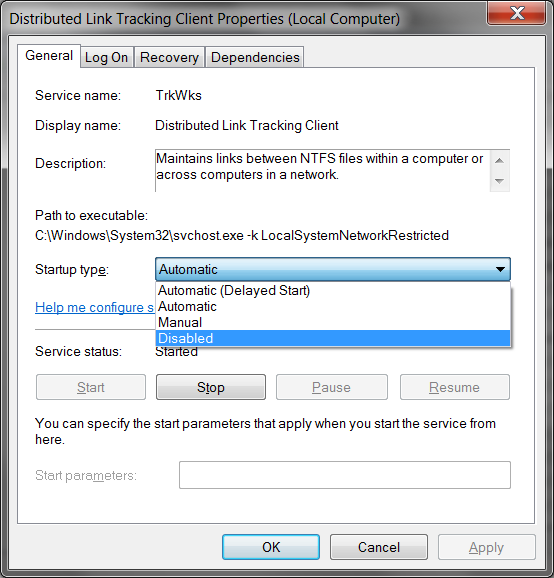 In this command "trkwks" is the Service name from the above dialog, but if you go back to the tasklist command at the beginning of this article you'll notice you can find it there as well.